Monarch Air Group provides private air charter in Tallinn, Estonia. Our clients benefit from top-notch service, unrelenting dedication to safety, wide selection of aircraft, and years of experience in chartering private jets. To obtain a free quote, please use our online quoting tool provided below, or call toll free 1-877-281-3051. Monarch Air Group provides private jet charter flights in and out of Tallinn, Estonia. The capital of Estonia, Tallinn is a port located on the banks of the Gulf of Finland in the northern part of the country. For the last few decades, it has developed enormously und undergone great changes after the collapse of the Soviet Union and switching from communism to capitalism. 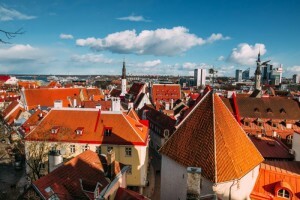 One of the Europe’s medieval cities, Tallinn, is seacoast capital with wonderful architecture, primeval ruins, spectacular views and dynamic nightlife. The Old Town of Tallinn was given a status of a World Heritage Sites by UNESCO in 1997. The Old Town boasts numerous cobbled streets, historic buildings, and picturesque ruins(dating from the 12th to the 14th centuries), cafes and restaurants, galleries, boutiques, and museums. The most notable attractions are the Freedom Square, the Town Hall Square, the Alexander Nevsky Cathedral, the Tallinn City Museum, the Art Museum of Estonia, the Estonian Open Air Museum, the Botanical Gardens, the Tallinn Zoo, Rocca al Mare Tivoli, the Rotermann Quarter, the Kadriorg Palace and Park, the St.Mary’s Cathedral, the Toompea Castle, the St.Catherine’s Passage, and some others. Tallinn is a beautiful medieval capital city in Eastern Europe, attracting tourists from all parts of the world especially from other European countries.